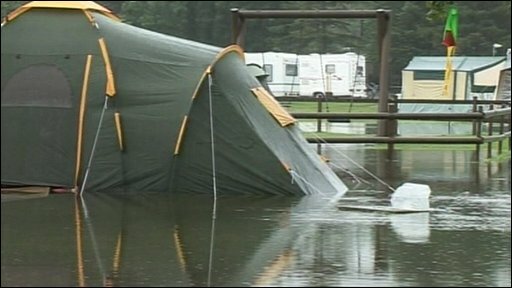 You will need a brolly on holiday in the UK in August - the Met Office is issuing a revised forecast for more unsettled weather well into the month. It is a far cry from the "barbecue summer" it predicted back in April. The news will raise questions about the Met Office's ability to make reliable seasonal forecasts. But the organisation has defended its record, saying people have already forgotten the hot weather experienced across many parts of Britain in June. It also highlights the absence of the sort of major floods that blighted 2007 and 2008; and the largely fine weather for the Wimbledon tennis championship, the cricket Tests and the Open golf. The Met Office also says temperatures have been around or above normal, and that the end of August might be better again. It did indeed stress at the time of the summer forecast in April that the odds of a scorching summer were 65%. It explains that it coined the phrase "barbecue summer" to help journalists' headlines. But this has come back to bite the organisation because many people do not feel like they have been enjoying a "good" summer, especially compared with previous searing years. Some now ask if the Met Office risks its reputation by attempting to popularise its work this way. Certainly, at the time of the forecast there was pressure on the Met Office from tourism chiefs in the UK to be positive about holidays at home. Did Met Office staff feel an obligation to put on a sunny face? The real problem for the Met Office is that this is the third summer in a row where its forecast has failed. In 2007, the Met Office chirped: "The summer is yet again likely to be warmer than normal. There are no indications of a particularly wet summer." We got downpours and floods in the wettest summer for England and Wales since 1912. Temperatures were below average. In April 2008, the Met Office forecast: "Summer temperatures are likely to be warmer than average and rainfall near or above average." That did not prepare people for one of the wettest summers on record with high winds and low sunshine. In both instances, the Met Office failed to predict the movements of the jet stream - the high-level wind that races round the world 10km above the surface. The past two years it got stuck on top of southern England - and that locked a low-pressure system in place which in turn brought misery and rain. That has been happening again this July. Temperatures in both previous years were dragged down by the Pacific La Nina effect which makes it four times more likely that we will suffer a bad summer in Europe. But this year, the La Nina effect no longer applies. This year was supposed to be "warmer than usual with rainfall average or below average". Chief meteorologist Ewan McCallum said in April: "We can expect times when temperatures will be above 30C - something we hardly saw last year." On that particular detail he was right (just) - and might yet be right again before summer turns to autumn. Mr McCallum admitted in a news conference in April that seasonal forecasting was still in its infancy - a cross between climate change prediction and tomorrow's weather forecast. But he said normal forecasting had massively improved, with the four-day forecast now as good as the one-day forecast when the Met office started more than 30 years ago. Seasonal forecasting would improve, too, he said. The Met Office head of forecasting Brian Goulding said at the time: "Seasonal forecasting is a difficult thing to do and this places some limitations on our forecasts. Our predictions for last autumn, winter and spring have all given accurate advice, giving more confidence in our latest summer forecast." Independent meteorologist Philip Eden told BBC News that Met Office forecasts were "generally fairly accurate". Instead, he blamed "spinners" in the Met Office press office for exaggerating the certainty of forecasts. But the independent weather forecaster Piers Corbyn says the Met Office failed to make a correct forecast because it cannot predict the jet stream. He claims his solar-based forecasting method is consistently more accurate for medium-term predictions than the Met Office, and he urges them to give up medium-term forecasting. The Met Office complains in response that Mr Corbyn will not publish his "unique" methods of forecasting. For the record, Mr Corbyn predicts that August will be generally wet and cool, especially in the West and the North later.